Boiler Filters | Providing Boiler & Central Heating quotes. Keeping your central heating working efficiently. Contaminated system water is a serious problem for homeowners. Central heating systems can quickly be damaged by a wide range of unwanted system deposits when the system has not been thoroughly flushed and inhibited. Harmful deposits can range from tiny particles such as magnetite and limescale to larger solder debris and non-ferrous metal flakes. They can quickly cause blockages and/or damage to key components within the boiler and heating system. Heat exchangers can also become blocked by the system contaminates, while components such as pumps and valves will also suffer, increasing the chance of system failure. When a system is not protected, a build-up of iron oxide (rust) or non-magnetic deposits can occur within just 3 weeks, resulting in significant energy efficiency losses and fuel wastage. This reduction in efficiency can reduce a boilers SEDBUK efficiency rating from band A down to band D. Such a reduction causes the boiler to work harder when trying to deliver the desired temperature, further increasing the risk of component failure. Within a non-filtered system, radiators can become blocked, reducing the heat transfer from the system into the property. This dramatically affects the efficiency of the central heating system and the heating comfort the homeowner receives. With a Greenstar System Filter, homeowners can save up to 6% per year on heating energy bills* whilst also benefit from a warmer home and a quieter heating system. A Greenstar System Filter will also help protect the environment by reducing a home’s CO2 emissions. O-rings are specified using the same compounds that are found on our market leading boilers. The robust filter body has been pressure tested to 45 bar. The effectiveness of the Greenstar System Filter is based on its innovative cylindrical design, which allows the maximum possible surface area of the magnet to be exposed to the heating system water. This cylindrical shape channels the water in an upwards spinning motion, assisting in the twin-action filtering process, whilst also providing a large capacity for captured system pollutants. Maximum debris collection through cyclonic motion As the diagram demonstrates, the Greenstar System Filter leads system water directly to the highly powerful magnet that is integrated inside. This has the effect of forcing water around the magnet causing the water to move upwards in a cyclonic motion. This motion maximises the contact of the system water with the magnet, whilst also increasing the time that the water remains within the filter. In this process, any magnetic system pollutants or debris will be drawn on to the magnet sheath and will remain there until the filter is cleaned. Non-magnetic debris gets forced over the cyclonic trap which has specifically designed surface inlets that allow both small and large particles to be trapped within the base of the filter. Importantly these inlets are designed in-line with the spinning motion of the system water flow, ensuring no particles escape back into the system. SpiroTrap MB3 prevents the build up of dirt contaminating your central heating system helping to ensure that it is operating at its maximum efficiency. Highly recommended for all types of boilers, especially high-efficiency boilers. Unique dual action – automatically and continuously removes both magnetic and non-magnetic dirt from the heating system. The central heating system water is circulated through the filter to remove the black iron oxide and other non-magnetic debris preventing it from being circulated within the system thereby protecting the heat exchanger, pump and valves in the boiler. 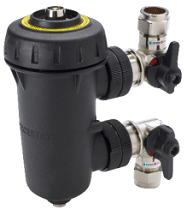 The proven design of the Greenstar System Filter offers a capacity to collect up to 300g of debris. The proven design and size of the Greenstar System Filter enables the system water to be slowed down as it circulates around the filter. This results in a greater capture of debris on the first pass and a higher retention. At the centre of the Greenstar System Filter is a highly powerful internal magnet that removes the metallic debris that is present in the system heating water. The central location of the magnet within the system filter ensures that magnetite is collected quickly and retained. Don’t be fooled by its size. 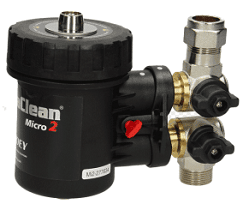 The MagnaClean® Micro2 is our smallest filter, but its performance is still powerful. Streamlined to fit easily into the tightest of spaces, it provides exceptional protection against magnetite and other debris for small heating systems.